Gala Night MC Bob Johnson from Caithness FM. Guard of Honour Thurso Sea Cadets. Guest Speaker Councillor Bill Fernie. 6.30pm Mina MacKay’s Highland Dancers Display in Sir John’s Square. 7.00pm Gala Queen Ceremony, Sir John’s Square then the Gala Parade including Caithness Rhythmic Gymnastics and is led by the Caithness Junior & Thurso Pipe Bands. 10.00pm Gala Dance Skinandis, see posters for details. 2.00pm Baby Show in The Thurso Club, Birth – 2years, entry £2 per baby. 2.00pm Children’s Story. Under 5 years. Thurso Club, Janet Street entry £2 per child. 7.00pm Beach Party, weather permitting, Race of Tasar & Laser Yachts. Hee-Haw Donkeys, Beach competitions. BBQ, Canoeing, Jet Skiing, Kite Surfing, Surfing & water-skiing Demonstrations. 3.00pm Party at the swimming pool Over 8 years, entry £2 per child. 7.30pm Whist Drive, Scout Hall Riverside, entry £1. 7. 7.30pm Adults Race Night. Central Hotel. 7.30pm Quiz Night in the Thurso Club, £5 per team. 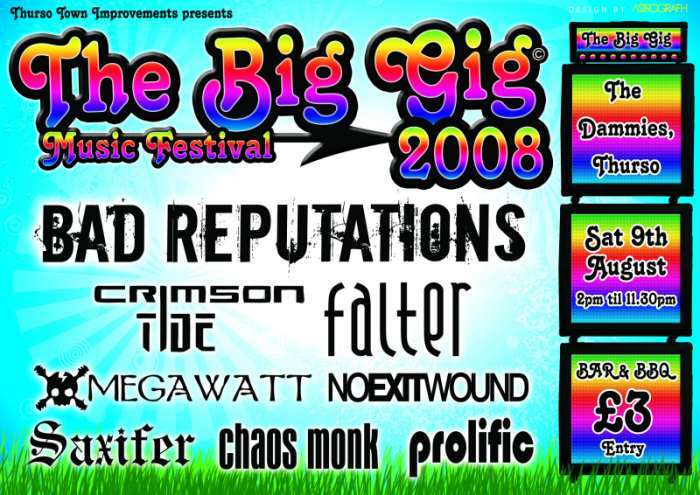 2.00pm The Big Gig with various local bands, Sir George’s Park (The Dammies) entry £3. 1 11.00am Car boot Sale £5 per car, Sir Archibald road contact Chamb1511@aol.com. 12-midday It’s A Knockout competition, family fun in the Dammies, Kuk Sool Won Display, car boot sale & a fun dog show. Friday 01/08/08 entry £4 per pair. Sea Boat fishing competition 09/08, contact Harpers Fishing Tackle shop for information. 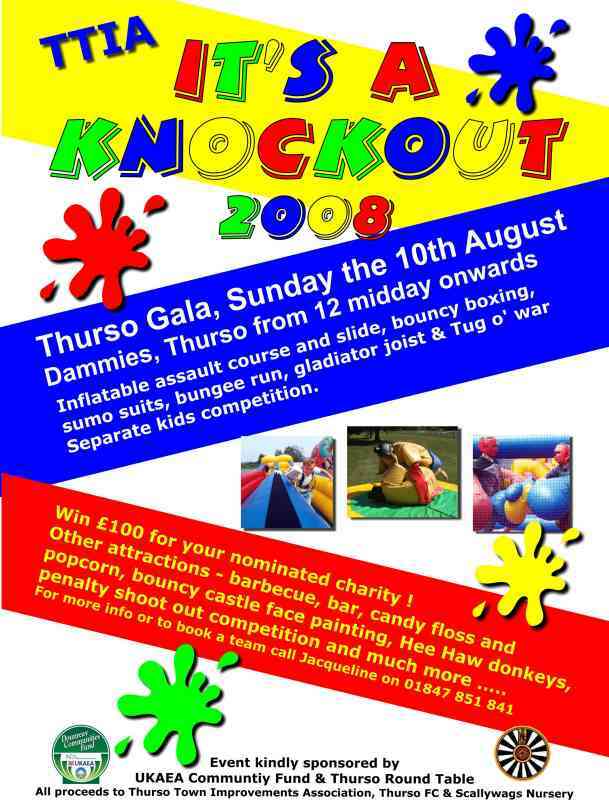 It's that time of year again when we are recruiting teams for the Thurso Gala 2008, It's a Knock Out Event. Teams of up to six people are being invited to apply to compete in this years competition to be staged at the Dammies, Thurso on Sunday the 10th of August, from midday onwards. The same three charities will be hosting the event, Thurso Town Improvements, Thurso Football Club, along with ourselves at Scallywags Nursery. The equipment on the day will consist of a bouncy boxing ring, gladiator joist, bungee run, sumo suits, tug of war and an inflatable assault course finale. We hope to also stage a mini knock out competition for the kids, children's races and a penalty shoot out. Other attractions on the day will be a licensed bar, barbecue, face painting, bouncy castle, Hee Haw donkeys and more to be confirmed. If your group or your organisation would like to take part in this fun event, please do not hesitate to contact me on 01847 851 841 or via email on mackenzie@inkstack.fsnet.co.uk Come along and support your local community whilst having a laugh at the same time. Thurso Fire Station took part last year and won £100 for their own charitable fund, you could do the same. I'll looking forward to hearing from you all.